The Ku-ring-gai Chase National Park is an Australian treasure full of wonderful wild animals and flora. This short video highlights the natural beauty of water, rock, native plants, bird sounds and sky. 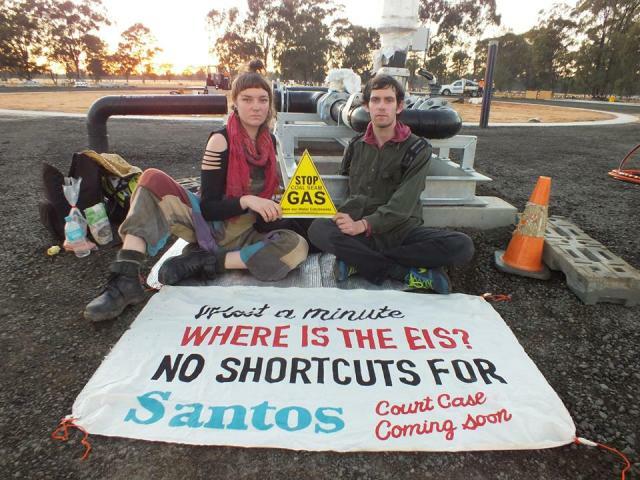 We’ll be in the NSW Land and Environment Court this week on behalf of our client People for the Plains who is seeking an injunction to prevent Santos from developing its 'Leewood' coal seam gas (CSG) wastewater treatment facility without first undertaking the proper planning and environmental assessment (EIS). The facility is located near the Pilliga State Forest, near Narrabri in North-West NSW. If you’d like to know more about the case, read our blog postDefending the Pilliga in Court by Sue Higginson, our CEO and Principal Solicitor. 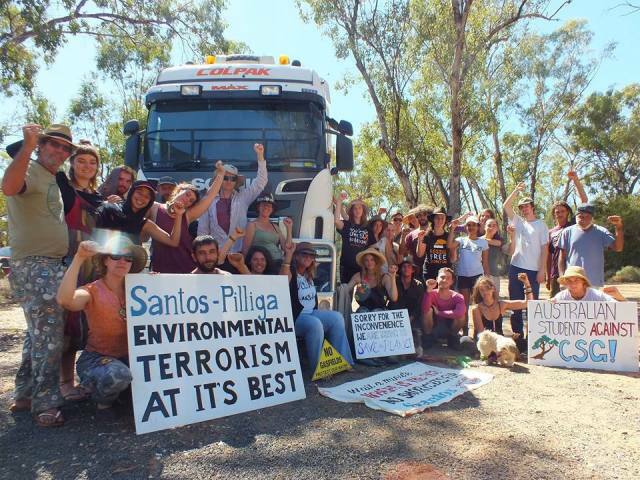 Three students from the Australian Student Environment Network (ASEN), and one other protector from Camp Quoll, have taken direct action as part of the ‪‎Pilliga Push‬ campaign against Santos’s Narrabri coal seam gas (CSG) project, in the Pilliga forest. Today’s protest is aimed at opposing construction of the controversial Leewood wastewater treatment facility and highlights an upcoming court challenge in the NSW Land and Environment Court concerning the approval process of the facility. A new study from climate scientists Robert DeConto at the University of Massachusetts Amherst and David Pollard at Pennsylvania State University suggests that the most recent estimates by the Intergovernmental Panel on Climate Change for future sea-level rise over the next 100 years could be too low by almost a factor of two. Details appear in the current issue of Nature. DeConto says, "This could spell disaster for many low-lying cities. For example, Boston could see more than 1.5 meters [about 5 feet] of sea-level rise in the next 100 years. But the good news is that an aggressive reduction in emissions will limit the risk of major Antarctic ice sheet retreat." With mechanisms that were previously known but never incorporated in a model like this before, added to their ice-sheet model to consider the effects of surface melt water on the break-up of ice shelves and the collapse of vertical ice cliffs, the authors find that Antarctica has the potential to contribute greater than 1 meter (39 inches) of sea-level rise by the year 2100, and greater than 15 meters (49 feet) by 2500 if atmospheric emissions continue unabated. In this worst case scenario, atmospheric warming (rather than ocean warming) will soon become the dominant driver of ice loss. The revised estimate for sea-level rise comes from including new processes in the 3-dimensional ice sheet model, and testing them against past episodes of high sea-levels and ice retreat. The researchers find that "ocean-driven melt is an important driver of Antarctic ice shelf retreat where warm water is in contact with shelves, but in high greenhouse-gas emissions scenarios, atmospheric warming soon overtakes the ocean as the dominant driver of Antarctic ice loss." Further, they find that if substantial amounts of ice are lost, the long thermal memory of the ocean that will inhibit the ice sheet's recovery for thousands of years after greenhouse-gas emissions are curtailed. DeConto and Pollard's study was motivated by reconstructions of sea level rise during past warm periods including the previous inter-glacial (around 125,000 years ago) and earlier warm intervals like the Pliocene (around 3 million years ago). These high sea levels, ranging from a few meters to 20 meters above today, imply that the Antarctic Ice Sheet is highly sensitive to climate warming. "So, at a time in the past when global average temperatures were only slightly warmer than today," says DeConto, "sea levels were much higher. Melting of the smaller Greenland Ice Sheet can only explain a fraction of this sea-level rise, most which must have been caused by retreat on Antarctica." To investigate this, DeConto and Pollard developed a new ice sheet-climate model that includes "previously under-appreciated processes" that emphasize the importance of future atmospheric warming around Antarctica. They explain that, "to date, research into Antarctic ice sheet vulnerability has focused on the role of the ocean, melting floating ice shelves from below. The ice shelves that fringe the land-based ice hold back the flow of inland ice to the ocean. However, it is often overlooked that the major ice shelves in the Ross and Weddell Seas and the many smaller shelves and ice tongues buttressing outlet glaciers are also vulnerable to atmospheric warming." They add, "Today, summer temperatures approach or just exceed 0 degrees C. on many shelves, and due to their flat surfaces near sea level, little atmospheric warming would be needed to dramatically increase the areal extent of surface melting and summer rainfall." "If protective ice shelves were suddenly lost in the vast areas around the Antarctic margin where reverse-sloping bedrock (where the bed on which the ice sheet sits deepens toward the continental interior, rather than toward the ocean) is more than 1,000 meters deep, exposed grounding line ice cliffs would quickly succumb to structural failure as is happening in the few places where such conditions exist today," the researchers point out. Businesses now have a handy step-by-step guide to inform their decisions on investing in one of the newer energy efficiency solutions in Australia. The NSW Office of Environment and Heritage (OEH) voltage optimisation guide helps businesses determine if this new technology will benefit their site, as well as dispel some common misconceptions around the technology. Voltage optimisation (VO) works by adjusting voltage supplied to a site. This can better meet the requirements of certain equipment and lights, resulting in improved equipment life and reduced energy use. Ian Hunter, Deputy Chief Executive, NSW Office of Environment and Heritage said VO technology is fairly well-known overseas yet relatively new to Australia. "Internationally voltage optimisation has been shown as a useful option for businesses to reduce their energy use and improve equipment life," said Mr Hunter. "It is safe, proven technology, and you are not alone when examining your options. We're here to help you. "On optimal sites, some businesses have seen energy savings of up to 12 per cent or more. "The effectiveness of the technology really depends on a site's equipment, operational requirements and voltage supply. "The value of this guide is in helping businesses decide whether it's worthwhile for them to invest in voltage optimisation." An early adopter of the technology in Australia is hotel group Accor. Michael Cook, Chief Engineer of Accor's Sydney Olympic Park hotels, said the technology has achieved a 7.7 per cent saving in overall energy use across its Novotel and Ibis venues. "Voltage optimisation can be quite complicated to implement as there are many things that need to be weighed up, but the benefits of it are worthwhile," Mr Cook said. "Not only have we saved on our total energy use, voltage optimisation has enabled us to reduce our peak time consumption, meaning we're consuming less power when it is at its most expensive." The new guide provides a simple five-step framework for decision-making, as well as practical toolkit of checklists and business templates that simplify each step. An accompanying e-learning course will also be developed as a companion to the guide, enabling business owners and managers to work through the decision-making process interactively. It is expected to be launched in April. The scientists, who studied the effects of beach replenishment efforts on the abundance of intertidal invertebrates at eight different beaches in San Diego County, discovered that the movement of sand onto those beaches resulted in a more than twofold reduction in the abundance of intertidal invertebrates after 15 months. "We found rather long lasting declines in invertebrate abundances due to replenishment," said Joshua Kohn, a professor of biology who headed the study, which was published this week in the journal Estuarine, Coastal and Shelf Science. "These invertebrates are what shorebirds eat when they poke their bills in the sand. They are also food for small inshore fish." "Such reductions may have far reaching consequences for sandy beach ecosystems," the researchers warn in their paper, "as community declines can reduce prey availability for shorebirds and fish." While other researchers had previously looked at the impact of beach replenishment on certain taxa of invertebrates at specific beaches, the UC San Diego study is unusual in that it examined the impact on the total invertebrate community across eight different beaches in San Diego County from Oceanside south to Imperial Beach. The UC San Diego biologists were also able compare their results at each beach where sand was pumped onshore to an untreated section of the beach, which served as a control. The opportunity to conduct the study came about in the fall of 2012 when the San Diego Association of Governments, or SANDAG, and the U.S. Army Corps of Engineers embarked on an ambitious project to replenish eight beaches with a total of 1.76 million cubic meters of sand. Only portions of each beach were replenished so that other sections of the beach could be used for foraging birds and fish. "This provided the strongest experimental system yet to assess the effects of replenishment," said Kohn. "With replenished and control sections of each beach, we could assess both the general effects of replenishment as well as variation among beaches in their invertebrate communities and responses to replenishment." To conduct their study, Kohn and the other co-authors of the study, Heather Henter, a biologist and academic coordinator of the Natural Reserve System, and Tyler Wooldridge, a graduate student, enlisted the help of undergraduates in UC San Diego's Environmental Systems program to sample the replenished and control sections of each of the eight beaches starting in the fall of 2012. The students then resampled those sections four months later, 12 months later and 15 months after the initial replenishment. The eight beaches sampled from north to south were South Oceanside Beach, North Carlsbad Beach, South Carlsbad Beach, Batiquitos Beach, Moonlight Beach, Cardiff State Beach, Fletcher Cove and Imperial Beach. "When people look at the sandy beach it looks like nothing could possible live there," said Henter. "It looks devoid of life. But when you actually dig down into the sand, there are a lot of creatures. This seems odd because there is no primary production on the beach. No plants grow there so there should be nothing to eat. But the sandy beach animals feed on seaweed and detritus cast ashore and plankton that washes in from the ocean." "In San Diego there are multiple species of tiny worms called polychaetes," she added. "Little bean clams, Donax gouldii, are sometimes on our beaches by the thousands and there are various crustaceans such as amphipods (sandhoppers) and mole crabs, Emerita analoga, that stick their feathery antennae up above the sand to filter food out of the waves in the swash zone." The researchers found that nearly all taxa showed major declines in their abundances shortly after beach replenishment, but that populations of sandhoppers and bean clams recovered within one year. On some beaches, populations of mole crabs bloomed four months after replenishment and were even more numerous for a short time than on control portions of beaches, but subsequently declined. Polychaete worms, the most common invertebrates at the beach, meanwhile, showed sharp declines at all of the beaches that continued to the end of the study. "There's a lot we don't yet know about the effect of sand replenishment on the community of organisms that live in the sandy beach, and the animals that depend on them," said Henter. "In our study, some species seemed to increase in abundance after replenishment, others decreased, but this was really variable." Because sandy beaches make up two-thirds of the world's shorelines and many other beach communities around the nation and world employ costly replenishment efforts to combat erosion at economically important beaches, the UC San Diego biologists believe it's critical to continue studies of the ecological impact of beach replenishment. "There are large gaps in our knowledge," said Wooldridge. "For instance, how long will the effects we observed last? What is the effect of reduced invertebrate abundance on bird and fish populations? Another key question is how frequent and widespread should efforts to replenish beaches be? Are there times of the year when it is more or less disruptive for the animals that live in the sandy beach? To answer those questions, we need more studies." New groundbreaking research shows that with improved fishing approaches -- compared to business as usual -- the majority of the world's wild fisheries could be at healthy levels in just 10 years and global fish populations could double by 2050. The study conducted by researchers from UC Santa Barbara, the University of Washington and the Environmental Defense Fund appears in theProceedings of the National Academy of Sciences. "This research shows that we really can have our fish and eat them, too," said lead author Christopher Costello, a professor of environmental and resource economics at UCSB's Bren School of Environmental Science & Management. "We no longer need to see ocean fisheries as a series of trade-offs. In fact, we show that we can have more fish in the water, more food on the plate and more prosperous fishing communities -- and it can happen relatively quickly." The paper demonstrates that by 2050, applying the same improved fishing approaches could increase profits from the world's ocean fisheries by 204 percent versus what can be expected under a business-as-usual approach. The increased harvest would be enough to provide a significant source of protein for an additional 500 million people. In the coming decades, with a projected 9.5 billion people competing for more food from maxed-out resources, finding sustainable ways to increase food production has become a critical challenge, Costello noted. Calculations performed by the investigators showed that if reforms were implemented today, three-quarters of exploited fisheries worldwide could attain population goals within 10 years -- and 98 percent by mid-century. The team used a massive database of 4,713 fisheries representing 78 percent of the ocean's catch. This enabled a far more precise and more granular analysis than ever before. "We've uncovered a really important insight: There is urgency and a tremendous upside in reforming thousands of small-scale, community fisheries around the world," said co-author Ray Hilborn, a professor of marine biology and fisheries science at the University of Washington. "The research adds to the body of work showing that most of the world's large fisheries are doing relatively well, but it emphasizes the critical need to rebuild local fisheries, most of which are in the developing world where millions depend on fisheries for food and their livelihoods." The analysis suggests that implementing reforms such as those based on secure fishing rights are critical to providing the combined benefits of increased fish populations, food production and profits. "Fishing rights" is a fishery management approach that ends the desperate race to fish by asking fishers to adhere to strict, science-based catch limits in exchange for a right to a share of the catch or to a traditional fishing area.
."We now have a clear roadmap for how to recover fisheries: Give fishermen secure fishing rights so they can control and protect their future," said co-author Amanda Leland, senior vice president for oceans at the Environmental Defense Fund. "Countries from the U.S. to Belize to Namibia are leading a turnaround by implementing secure fishing rights and realizing benefits for people and the oceans." Since 2000, overfishing in U.S. federal waters has dropped by 70 percent as the number of species managed with fishing rights or "catch shares" has quadrupled. In the past three years, fishing industry jobs have increased 31 percent and fishing revenues have grown by 44 percent. In Belize, a fishing-rights program newly implemented by the government for small-scale fishermen has dramatically increased compliance and shows tremendous potential for recovering important local species. "Our research reveals a stark choice: Either manage fisheries sustainably and realize the tremendous potential of the world's oceans, or allow the status quo to continue to draw down the natural capital of our oceans," said Costello. The Australian Renewable Energy Agency (ARENA) today congratulated the developers of recently commissioned Moree Solar Farm (MSF) for reaching a landmark power purchase agreement. Under the agreement with developer Fotowatio Renewable Ventures (FRV), Origin Energy will purchase 100 per cent of the electricity and large-scale generation certificates (LGCs) generated by MSF for the next 15 years. This partnership brings to fruition the project’s commercial potential, made possible by FRV taking the project risk with support provided by ARENA and the Clean Energy Finance Corporation (CEFC). ARENA and the CEFC have a long history of successfully working together, having provided complementary grant funding support and debt financing for a range of projects since June 2014. All such co-investments supported later-stage projects that were not yet fully commercially competitive. The roles of ARENA and CEFC are uniquely distinct but complementary. Through the provision of innovative grant funding coupled with deep commercial and technical expertise, ARENA provides the support needed to accelerate the development of promising new solutions towards commercialisation. The CEFC provides finance to de-risk and demonstrate bankability, which helps to bring near-commercial and commercial projects to reality. Most notably, ARENA and the CEFC have been working together on a funding round for large-scale solar projects, with ARENA making $100 million available in grants and the CEFC $250 million in loans for eligible projects. ARENA has invited 22 high merit large-scale solar project proposals, with a total project value of $1.68 billion, to proceed to the full application stage of the competitive round. The projects are seeking approximately $332 million in grant funding, are located in all mainland states and have a total capacity of 766 megawatts (MW). None of the projects would proceed in the near future without the provision of grant funding from ARENA. Come and join us for a walk through Ingleside Chase Reserve, Pittwater’s largest continuous piece of bushland that contains many beautiful plant communities and threatened fauna. The walk will commence at Irrawong-Epworth Reserve and climb to Ingleside Park. At the park we will have a morning tea break and then head back down. The track is 1.5km one-way and is a little steep in parts so although we will be taking it at a gentle pace, a reasonable level of fitness is required. Come for a morning with the birds. We will take you for a fantastic guided walk to learn more about our feathered friends. Our birding mornings are guided by local experts and are a great opportunity to get a better look at our local bird life. A great activity for those people interested to learn more as well as passionate birdwatchers. It’s a great morning out for everyone! The NSW Minister for Mental Health, Pru Goward and UNSW’s Chair in Intellectual Disability Mental Health, Professor Julian Trollor (Photo: UNSW Media). Mental health treatment for the 135,000 people in New South Wales living with an intellectual disability is set to improve, thanks a world-first manual to guide mental health professionals. The Intellectual Disability Mental Health Core Competency Framework for Mental Health Professionalswas launched today by UNSW’s Chair in Intellectual Disability Mental Health, Professor Julian Trollor and the NSW Minister for Mental Health, Pru Goward. The manual was commissioned following Australian research that found most mental health professionals lack confidence managing mental disorders in people with an intellectual disability. This is compounded by the poor access to services and treatment outcomes for this group, who experience mental health problems at a rate three to four times higher than the rest of the population. Professor Trollor said meeting the mental health care needs of Australians living with an intellectual disability remained a huge challenge facing the mental health workforce. “We still have some way to go in this area, but we expect the manual will help mental health professionals to assess and respond to the mental health needs of this vulnerable group, to a standard that meets community expectations,” Professor Trollor said. Meeting the mental health care needs of Australians living with an intellectual disability remains a huge challenge facing the mental health workforce. Ms Goward said the new manual also outlined important issues from the perspective of people with an intellectual disability, their families and support networks. “This manual is going to make a difference to the mental health and wellbeing of people with intellectual disabilities,” Ms Goward said. The NSW Government has funded the UNSW Chair in Intellectual Disability Mental Health since 2009. In 2015, a further $3.9 million was committed to continue the work of the Chair to help improve the mental health and wellbeing of people with intellectual disabilities through to 2020. Documents can be skimmed 60% faster than presently and with higher recall, shows research from Aalto University. The amount of data that we take in from screens each day through documents, email chains, web pages and social media flows is enormous. The continuous scrolling technique we typically use to browse this data is, however, far from perfect. "In conventional scrolling a number of objects are moving in the viewer window, which is problematic for visual attention. First, motion blur makes it impossible to focus on an object. Second, the user is not able to direct attention for long enough to comprehend the content before it scrolls out of the window," explains Postdoctoral Researcher Byungjoo Lee. Together with Olli Savisaari and Antti Oulasvirta they have developed a new scrolling technique which better supports data processing in three different ways. "Browsing of long texts speeds up by 60% and less than half as much time is spent locating the desired locations in the text. In addition, the probability of noticing points of interest in the text is increased by 210% compared to normal scrolling technique ," Dr. Lee explains. The new technique has been given the name Spotlights and is based on the spotlight metaphor of human visual attention. According to existing research, visual attention needs about half a second to focus, which is clearly longer than the average amount of time that a sentence or picture remains on the screen when using the normal scrolling technique. "The new technique locates on each web page, whether it is a pdf document, video or web document, the visually important elements and presents them using a transparent layer than appears on top of the text. The elements can be, for example, pictures, tables or headlines. It chooses what you should focus and allows you enough time to do that," Dr. Lee tells. "Our empirical evaluation showed that benefits are significant. In this way people can scroll through as many as 20 pages per second and still retain information. The technique improves recollection of browsed information," Prof. Oulasvirta explains. "Our technique is the first to try to maximise the amount of the information on the screen for human visual attention. To see such strong results is very encouraging," Oulasvirta summarizes. "Spotlights is still a prototype. We seek possibilities to put this in practice in browsers, PDF viewers etc.."
The proportion of Australians who were born overseas has hit its highest point in over 120 years, with 28 per cent of Australia's population born overseas, according to figures released today by the Australian Bureau of Statistics (ABS). The percentage of Australian residents born overseas has increased every year for the last 15 years. "The number of Australian residents born in India has almost tripled over the last 10 years and residents born in China have more than doubled in this time." The change in our migrant mix can best be observed in the differences in median age of certain groups. "Migrants born in Italy, for example, had a median age of 64.7 years in 2005. This increased to 69.3 years in 2015 - indicating a drop in recent migration and the aging of existing migrants," said Ms Cho. "On the other hand, migrants from our Asian neighbours, such as India, have seen a reduction in median age from 37 years in 2005 to 33.4 years in 2015." (b) Top 10 countries of birth excluding Australia. (c) All population figures presented in this table are rounded. Estimates of the proportion of the Australian population are based on unrounded numbers. Looking at Net Overseas Migration for 2014-15, a decrease from the previous year was recorded, with an annual estimate of 168,200 persons. This was 9.8 per cent (18,200 persons) less than in 2013-14. At a state level the largest gains were in New South Wales with 66,100, Victoria with 54,100 and Queensland with 19,100. In the Net Interstate Migration figures for 2014-15, we see Victoria extending its lead from the previous year over the other states with the net gain increasing to 10,200 compared with 8,800 from the previous year. Queensland had the second highest net gain from interstate migration with 6,400. While New South Wales once again recorded the largest net loss in 2014-15 (-6,600). The net losses for New South Wales however, have significantly reduced from the -25,600 of ten years earlier. More information can be found in Migration, Australia, 2014-15 (cat. no. 3412.0), available for free download from www.abs.gov.au. Asset rich but income poor is the story for nearly one-third of older Australians in low income households, according to new figures released today by the Australian Bureau of Statistics (ABS). Jacqui Jones, the ABS' Program Manager of Labour and Income Branch, said in 2013-14, 54 per cent of older low income households had wealth in the top 40 per cent of Australian households, where wealth is the value of a household's assets less the value of its liabilities. "While many older low income households have liquid assets such as bank accounts and shares available to them, there was large variation in the amounts available; one-third had over $50,000 worth of liquid assets in contrast to one-third of older low income households who had less than $5,000 in these sorts of cash assets," Ms Jones said. Housing costs have a large impact on low income households, with the average cost of housing for older low income households at $106 per week. Three-quarters (74 per cent) of older low income households owned their home outright and eight per cent were renting. In contrast, 19 per cent of younger low income households had wealth in the top 40 per cent of Australian households. “Half of all younger low income households have less than $1,000 in liquid assets and two-thirds of younger low income households had liquid assets of $5,000 or less,” said Ms Jones. The average cost of housing for younger low income households was $216 per week. Almost one-fifth (18 per cent) of younger low income households owned their home outright and two-thirds either had a mortgage or were privately renting. More information is available in the feature article, Wealth of Low Income Households (cat. no. 6523.0), available for free download from the ABS website (www.abs.gov.au). This illustration depicts two neutron stars colliding. As they merge, the stars eject material into space at 10 to 50 percent the speed of light. Mergers of these kinds of stars are thought to be the source of gold and other heavy metals found throughout the universe. Credit: Stephan Rosswog, Jacobs University Bremen. 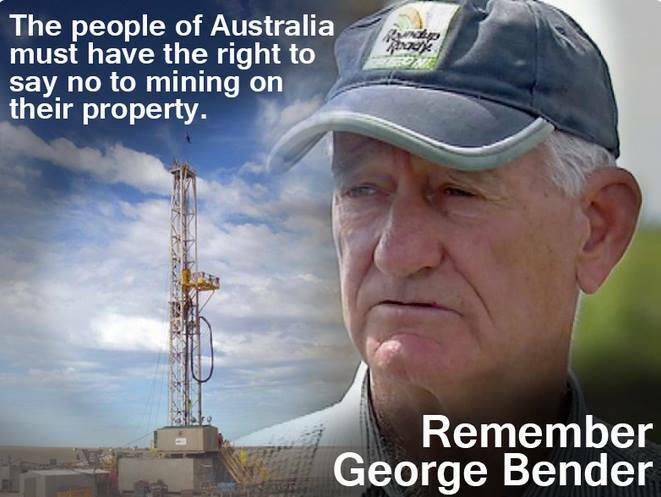 So you think the gold in your ring or watch came from a mine in Africa or Australia? Well, think farther away. Much, much farther. Michigan State University researchers, working with colleagues from Technical University Darmstadt in Germany, are zeroing in on the answer to one of science's most puzzling questions: Where did heavy elements, such as gold, originate? Currently there are two candidates, neither of which are located on Earth -- a supernova, a massive star that, in its old age, collapsed and then catastrophically exploded under its own weight; or a neutron-star merger, in which two of these small yet incredibly massive stars come together and spew out huge amounts of stellar debris. "At this time, no one knows the answer," said Witold Nazarewicz, a professor at the MSU-based Facility for Rare Isotope Beams and one of the co-authors of the paper. "But this work will help guide future experiments and theoretical developments." "Our work shows regions of elements where the models provide a good prediction," said Nazarewicz, a Hannah Distinguished Professor of Physics who also serves as FRIB's chief scientist. "What we can do is identify the critical areas where future experiments, which will be conducted at FRIB, will work to reduce uncertainties of nuclear models." Astronomers using an orbiting radio telescope in conjunction with four ground-based radio telescopes have achieved the highest resolution, or ability to discern fine detail, of any astronomical observation ever made. Their achievement produced a pair of scientific surprises that promise to advance the understanding of quasars, supermassive black holes at the cores of galaxies. The scientists combined the Russian RadioAstron satellite with the ground-based telescopes to produce a virtual radio telescope more than 100,000 miles across. They pointed this system at a quasar called 3C 273, more than 2 billion light-years from Earth. Quasars like 3C 273 propel huge jets of material outward at speeds nearly that of light. These powerful jets emit radio waves. Just how bright such emission could be, however, was thought to be limited by physical processes. That limit, scientists thought, was about 100 billion degrees. The researchers were surprised when their Earth-space system revealed a temperature hotter then 10 trillion degrees. "Only this space-Earth system could reveal this temperature, and now we have to figure out how that environment can reach such temperatures," said Yuri Kovalev, the RadioAstron project scientist. "This result is a significant challenge to our current understanding of quasar jets," he added. "This is like looking through the hot, turbulent air above a candle flame," said Michael Johnson, of the Harvard-Smithsonian Center for Astrophysics. "We had never been able to see such distortion of an extragalactic object before," he added. "The amazing resolution we get from RadioAstron working with the ground-based telescopes gives us a powerful new tool to explore not only the extreme physics near the distant supermassive black holes, but also the diffuse material in our home Galaxy," Johnson said. The RadioAstron satellite was combined with the Green Bank Telescope in West Virginia, The Very Large Array in New Mexico, the Effelsberg Telescope in Germany, and the Arecibo Observatory in Puerto Rico. Signals received by the orbiting radio telescope were transmitted to an antenna in Green Bank where they were recorded and then sent over the internet to Russia where they were combined with the data received by the ground-based radio telescopes to form the high resolution image of 3C 273. The astronomers reported their results in the Astrophysical Journal Letters. In 1963, astronomer Maarten Schmidt of Caltech recognized that a visible-light spectrum of 3C 273 indicated its great distance, resolving what had been a mystery about quasars. His discovery showed that the objects are emitting tremendous amounts of energy and led to the current model of powerful emission driven by the tremendous gravitational energy of a supermassive black hole. The best way to reduce a child's chances of developing asthma might be making sure Mom had enough vitamin D during the second trimester, a new study from the University of Kansas shows. "Our health system spends billions and billions treating asthma, and there's lots and lots of opportunity costs," said David Slusky, assistant professor of economics. "Pain and suffering, loss of productivity and premature death -- asthma has all of those." When resources are being used inefficiently, that's when Slusky and his fellow economists like to step in. They knew about a recent medical hypothesis by Scott Weiss and Augusto Litonjua, both of whom are physicians with Brigham and Women's Hospital in Boston and professors at Harvard Medical School. Weiss and Litonjua hypothesize that vitamin D levels in the second trimester of pregnancy influence the probability that a fetus will develop asthma later in life. Slusky and colleagues Nils Wernerfelt of the Massachusetts Institute of Technology and Richard Zeckhauser of Harvard's Kennedy School put the medical hypothesis to the test using an economist's tools, such as survey and health data. "This is the golden age in the way that data about hospital discharges, insurance claims, birth certificates and death certificates are more and more available and more and more set up for researchers," Slusky said. "And that allows economists to get really large sample sizes with not a lot of cost." Then the economists looked at the measurements of sunlight in the birth locations when the asthmatics' mothers would have been in their second trimesters. Sunlight is where Americans get more than 90 percent of our vitamin D.
What the economists found was that a mother's increased sunlight exposure -- and therefore, vitamin D -- during this period lowers her child's chance of developing asthma. Because of concerns about individuals in different parts of the country being systematically different, Slusky and his co-authors looked at relative differences. "We're not looking at sunny places versus non-sunny places," Slusky said "We looked at the relative differences of the level of sunlight at a particular place at a particular time of year." "If that place is relatively more sunny during the second trimester, we found relatively lower rates of asthma," Slusky said. The findings indicate that the way pregnant women can get more vitamin D -- and lessen the likelihood of asthma in their children -- may be as simple as 10 minutes in the sun, which medical literature indicates is all most of us need for a daily dose of the "sunshine vitamin." "Skin cancer is a very serious disease, and I don't want to minimize it, but at some point that extra minute you spend inside is costing you more vitamin D than it's helping you not get skin cancer," Slusky said. "Calibrating this into the proper policy recommendation is something I'll leave to others, but I think that's where this research is going," Slusky said. Case in point, health officials in Australia are becoming more aware of vitamin D deficiencies. They have begun urging schools to relax requirements that students wear hats while outside during that continent's winter months of June and July. "Clearly if I'm going to the beach or going to spend all day outside, I need to put on sunscreen," Slusky said. "But spending 10 minutes outside without it may not be such a bad idea." For each additional month of paid maternity leave offered in low- and middle-income countries (LMICs), infant mortality is reduced by 13%, according to a new study by researchers from McGill University and UCLA Fielding School of Public Health. The finding, published in the journal PLoS Medicine, marks the first time that research has examined the impact of paid maternity leave on infant mortality in LMICs. Previous work has shown that paid time off is consistently associated with lower mortality of babies under one year old in high-income countries. "A significant number of countries where the vast majority of maternal and child deaths occur provide less than 12 weeks of paid leave to new mothers," said lead author Arijit Nandi, an Assistant Professor at McGill's Institute for Health and Social Policy and the Department of Epidemiology, Biostatistics, and Occupational Health. "Our findings suggest that paid maternity leave policies are a potential instrument for reducing preventable child deaths, even in countries where women are less likely to be working in the formal economy." To carry out their analysis, researchers utilized statistics on approximately 300,000 children born over a period of eight years in 20 LMICs¬ across Africa, Asia and Latin America, and combined that data with information on government maternity leave policies in those countries. They teased out the effects of lengthening paid maternity leave by comparing infant mortality rates in countries that expanded benefits with rates in countries where policies remained the same. After controlling for variables such as gross domestic product and per capita spending on health, the researchers found that adding just one month to the length of paid leave prevents about 8 infant deaths per 1,000 live births, equivalent to a 13% reduction in mortality. The most significant life-saving effect of extending paid maternity leave occurs during the post-neonatal period, when babies range in age from about one month to one year. • Paid maternity leave, with its guarantee of income and job security, may reduce a woman's stress level, a known risk factor in preterm birth and low birth weight. • Some policies permit time off as the due date approaches and that may allow expectant mothers easier access to third-trimester care. • After her child is born, a mother on paid leave may have more time to seek medical attention and care for an ill child. • A woman who takes time off from work at that point may be more likely to continue breastfeeding and to ensure that her baby receives vaccinations, both of which are important factors in infant health. One hundred and eighty-eight countries guarantee paid leave of some sort for new mothers. "While this study focuses on low- and middle-income countries, the impact in high-income countries is also well demonstrated. For the health of our children and the well-being of families, the U.S. needs to catch up with most of the world and ensure all new parents have paid parental leave," said study author Dr. Jody Heymann, formerly of McGill and now dean of the UCLA Fielding School of Public Health and founding director of the WORLD Policy Analysis Center. In Canada as well as in many European countries, a new mother is entitled to up to one year of paid time off. Only a few countries have no paid maternity leave mandate. They include Papua New Guinea, Suriname, and the United States. In future work, Nandi said, "We plan to document the effects of paid maternity leave on women's outcomes, including their labor force participation, health, and well-being, as well as the implications of paternal leave policies." MedUni Vienna has made a crucial development in the treatment of Multiple Sclerosis (MS): Together with his team and the research group led by Gernot Schabbauer, international partners from Australia, Germany and Sweden, Christian Gruber, Chief Researcher at the Center for Physiology and Pharmacology has demonstrated in an animal model that, following treatment with a specially synthesized plant peptide (cyclotide), there is no further progression of the usual clinical signs of multiple sclerosis. Gruber: "The one-off oral administration of the active agent brought about a great improvement in symptoms. There were no further attacks of the disease. This could slow down the course of the disease in general." MS is a chronic inflammatory autoimmune disease of the central nervous system, in which the insulating myelin sheaths around the nerve fibres are destroyed. The disease progresses in the form of attacks or episodes and is currently incurable. An episode is defined by the occurrence of new symptoms or flare-ups of pre-existing ones. Each episode is associated with immediate or deferred deterioration in the patient's condition. The mechanism of inflammation in the nervous system is partially understood. Based on this knowledge, there are treatments to slow down progression of the disease but these have significant side effects, particularly in long-term therapy. It is estimated that around 2.5 million people are affected by MS worldwide, around 8,000 of these in Austria. The discovery made by the Viennese scientists now offers hope that the disease can be halted at a very early stage or, at the very least, its progression greatly retarded. "As soon as functional neurological problems occur and an MRI (Magnetic Resonance Imaging) scan identifies early pathological changes in the central nervous system, the drug can be given as a basic therapy. In an animal model for MS, symptoms were considerably reduced by the oral administration of cyclotides. It is therefore possible that we could extend the interval between episodes or possibly prevent an onset of the disease," say Gruber and Schabbauer, summing up of the central finding of the study, which has now been published in the leading journal "PNAS." On the basis of this development, MedUni Vienna, together with Freiburg University Hospital has filed patent applications in several countries and licensed them out to Cyxone, a company they have set up to carry out further development (www.cyxone.com). The aim of this collaboration is to develop a safe, orally active drug for treating multiple sclerosis. A Phase I clinical trial for this could start at the end of 2018, says Gruber. Cyclotides are macrocyclic plant peptides that can be isolated from all the main plant families (e.g. coffee plants, cucurbits or even grasses and plants of the nightshade family) and therefore represent a large and wide-ranging group of natural substances. A further advantage: the medicine obtained from them can be taken orally. Many of the current MS treatments in common use have to be administered intravenously. The mode of action of cyclotides was discovered three years ago, also by scientists at MedUni Vienna, in collaboration with researchers from Freiburg University Hospital: they suppress the messenger substance interleukin-2 and hence the division of T cells, which act as "killer" or "helper" cells in the human immune system response. Hence, cyclotides could also possibly be used to treat other diseases characterized by an overactive, misdirected immune response, such as rheumatoid arthritis, for example.